The first hydroelectric scheme was installed in Wisconsin in 1882, three years after Thomas Edison invented the light bulb. 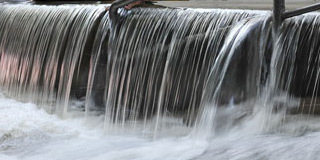 Soon after, hydropower became an important resource for electricity generation. 20% of total electricity consumed worldwide comes from hydroelectrical plants. In some countries hydropower supplies 80% of electricity. This has generally been supplied by larger hydroelectric schemes. Interest in small hydro declined from it’s historical roots due to the success of these large hydropower plants in bringing down costs and the success of other technologies such as nuclear and diesel generation. However concern about climate change, air quality and nuclear generation and increasing costs of fossil fuel based generation has renewed interest in small hydro and other renewable forms of generation.